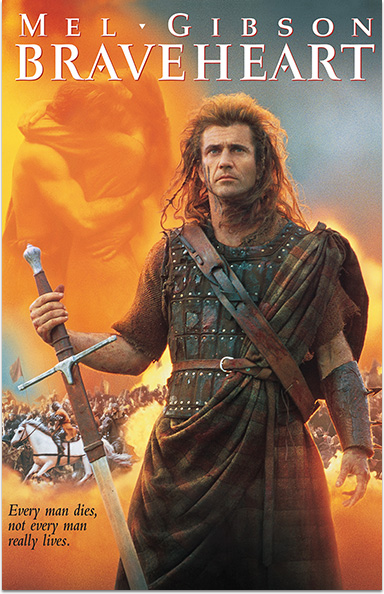 Braveheart, Mel Gibson's richly detailed, Academy Award®-winning saga of fierce combat, tender love and the will to risk it all for freedom, is now a digitally remastered, two-disc Special Collector's Edition DVD bursting with dynamic new special features. In an emotionally charged performance, Gibson is William Wallace, a bold Scotsman who uses the steel of his sword and the fire of his intellect to rally his countrymen to liberation from the English occupation of Scotland. Winner of five Oscars® -- Best Picture of 1995, Best Director (Gibson), Best Cinematography, Best Makeup and Best Sound Effects Editing -- Braveheart is "the most sumptuous and involving historical epic since 'Lawrence of Arabia'" (Rod Lurie, Los Angeles Magazine). BRAVEHEART ™, ® & © 2016 Paramount Pictures. All rights reserved.